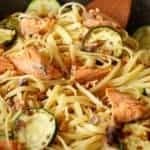 Salmon Zucchini Linguini is a super quick dinner winner! Ready in less than 30 minutes, canned salmon makes it fast and easy. No zucchini!? No problem, sub in what you have on hand. Bring a large pot, filled with 6 cups water, to a boil. Stir in pasta. Cook according to package directions, approximately 9 minutes. Drain pasta in a colander, reserving 1/3 cup pasta water. Meanwhile, in a large skillet, heat 1 ½ teaspoons olive oil over medium heat. Add walnuts and cook 5 minutes, stirring frequently. Remove walnuts from the pan and set aside in a small bowl. Return pan to stove and add remaining oil. Add zucchini; cook 7 minutes, stirring occasionally until softened and lightly browned. Add garlic and dried red pepper, cook 1 minute. Add salmon, drained pasta and reserved pasta water. Stir gently to combine and heat through. Serve in bowls. Garnish with chopped walnuts, parsley and a squeeze of lemon juice.